If you happened by Highpoint Sports & Wellness recently you likely noticed some changes. To start with, nine of the tennis courts at the club have been resurfaced. New lights, new wind screens and new nets have also been installed. 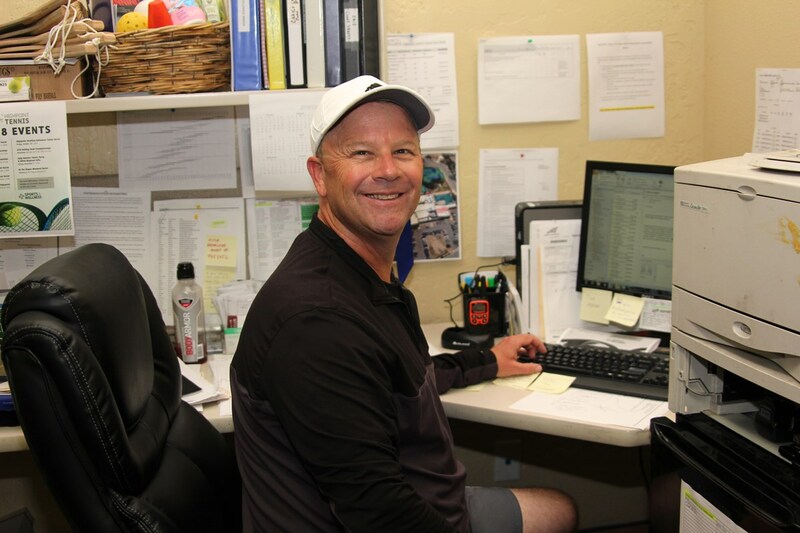 The biggest change of all at Highpoint was the appointment in January of Craig Bobo, the club’s new director of tennis. Bobo, who is 50, ran clubs in the Northeast. He came to Albuquerque from Rochester, New York. Craig and his wife Amber have five children. They range in age from 12 to 26. All play recreational tennis. Your surname is certainly different. I’m guessing that people ask you about it a lot. Where does that name come from? Its roots are in France. The way I heard it was when my relatives arrived at Ellis Island. The immigration officials saw the name Beaubeau and thought it should spelled Bobo. It’s not that common of name in the U.S. is it? Well, I do run into people who have the same last name. For instance, the football coach at Colorado State University is Mike Bobo, who is from Georgia. I grew up in the South. So it’s possible he is related to me down the line. By the way, I checked the U.S. Census Bureau. The name Bobo is ranked as the 3,052 most popular family name in the United States. I understand you played college tennis. How did that go? I wanted to play for the University of Alabama but I ended up instead at UTEP, which then was a member of the Western Athletic Conference, same as the Lobos. I did. I remember playing against Tim Cass a couple of times in doubles. I also played against Alan Dils. We had one heckuva match. Did you stay at UTEP? No, I eventually transferred to Texas State University at San Marcos and I played there. After college I achieved certification from both the USPTA and the PTR. I also hold certificates fir developing 10-and-unders and 11-17 year olds. 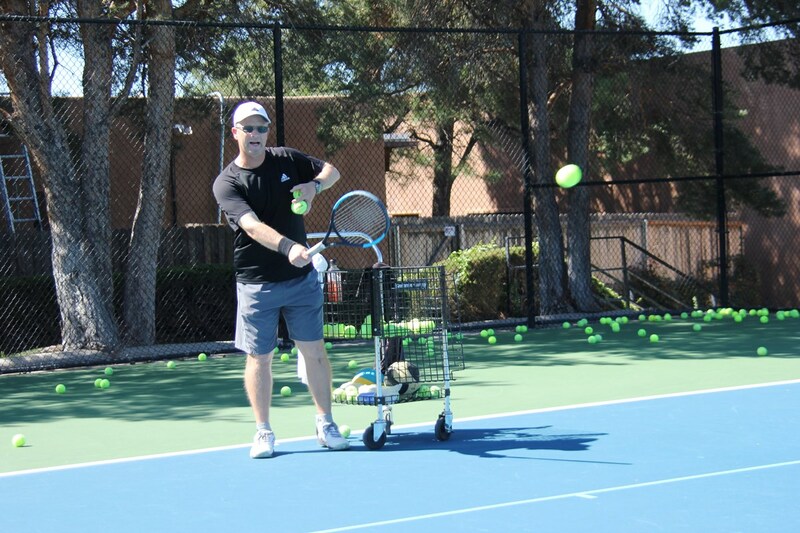 I have coached players on the Professional Futures Tour and enjoy giving adults fast-paced high-energy drills. Tell me about your first tennis job? It was at the Houston Indoor Tennis Club. It was a great place. It had eight courts and a viewing deck. Regrettably, it was demolished by a real estate broker. I then went to the Quail Valley Country Club, also in Houston. It had six indoor courts and 15 outdoor courts. I stayed there for six years until the club was sold.. Then I moved away from tennis for awhile. I was experiencing a case of tennis burnout. I went into corporate sales work. I was in charge of different products in the mortgage industry. Absolutely. I came back to it in 2001. I had always coached tennis on the side, and on the weekends. I had started playing tennis at age 6. My Dad is in his 70s and he is still a 4.5 player. My Mom is also a 4.5. My younger brother was ranked once but baseball was his first love. You have talked about having some mentors over the years—in tennis and in the business world. I had some very good mentors. One thing all of them stressed was customer service. That wisdom rubbed off on me. My first day at Highpoint was on January 18. From that day forward I remind the staff that treating members, who are customers, as you would want to be treated. Who is on your staff at Highpoint? There are five teaching pros on staff, and that includes me. Gary Stansifer and Wendy Thomas were already here. Gary is part-time but is still a very good player and coach. Wendy Thomas is in charge of Super Senior program and cardio classes on the courts. Blayne Drucker came from Houston. The fifth member, Max Winther, is from Albuquerque. He was also here before me. Any future plans for Highpoint? I would love to see three indoor courts here. I don’t know if that will happen, but it’s nice to think about. If you know someone who might be a good candidate for the Got a Minute? column, contact tobysmith68gmail.com and tell him. Photos of Craig provided by Sissy Kelly, USTA NNMTA Board Member.